BenQ W6000 review | What Hi-Fi? 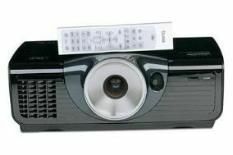 When compared to flatscreen TVs, the projector market is still fairly small, with a relatively limited number of products available. That means any new release in the category is exciting, especially one from a proven manufacturer like BenQ. So, here's the W6000, a Full HD, DLP projector with reassuringly serious dimensions and build. Thanks to flexible, manual controls for lens shift, zoom and focus, it's an absolute doddle to install, and despite slighty obtrusive menus, picture calibration is also straightforward. Just one warning – turning the ‘Dynamic Black' option on resulted in a loud grinding noise every time the iris switched for differently lit scenes. This may have just been our review sample, but for our money the picture's better with the option off anyway. The picture is a good one, too. Ice Age: Dawn of the Dinosaurs on Blu-ray is recreated with superb punch and clarity. Colours are vibrant without appearing garish, while whites are bright and pure. The image is unsurprisingly sharp, too, although there is slightly more smear to motion than you might expect. Switch to The Dark Knight, and although those colour and punch qualities remain, it becomes clear that there are rivals that offer more scintillating, stunning recovery. It's also true that the BenQ screen doesn't go as black as some other projectors, although it does make up for this somewhat with very respectable insight. The W6000's standard-definition performance is the same in every way: in an ideal world we'd like a little extra detail and black depth, but the lovely colours and punch make it a pleasure to watch. This is certainly one for the audition list.